Booking a hotel at Gatwick doesn't have to break the bank. With prices as low as £42.00, you can save up to 60% with our selection of cheap hotels near Gatwick Airport. The cost may be small but comfort and convenience are still top of the agenda. With HolidayExtras.com, paying the full price for cheap Gatwick airport hotels is a thing of the past. With a range of cheap Gatwick airport hotels available, you can enjoy your time away without your holiday budget suffering. And, by making your Gatwick airport hotel booking in advance, you can save even more money. That means pre-booking with Holiday Extras is the best route to cheap Gatwick hotels - you can save up to 60% off the price you'd expect to pay if you just turned up on the day. When Holiday Extras use the word cheap, it is only the price that is decreasing, it doesn't mean you will be sacrificing in any way, certainly not on quality, and not on location either. We have worked tirelessly to find cheap hotels that don't compromise your convenience. You might be surprised to learn that we have hotels as close as 1 mile from Gatwick from only £45! We appreciate that holidays can be expensive, which is why we want to cater for even the most budget conscious. If you opt to book a cheap hotel at Gatwick airport, you can rest assured that with Holiday Extras it doesn't mean you the quality will falter. Gatwick airport has a huge selection of 2-star, 3-star and 4-star hotels, each meeting the needs of even the most discerning of travellers. For the best in value, the Ibis Gatwick and the Corner House hotel are both 2-star hotels offering great low prices and a comfortable night's stay close to the airport. You'll also find the Skylane hotel, the Russ Hill, the Courtyard by Marriott and the Gatwick Worth hotel, all 3-star hotels offering cheap Gatwick hotel prices. If you want to extend the budget just a little further, check out some of our top quality 4-star Gatwick hotels. The Gatwick Menzies Chequers, the Mercure London Gatwick, the Copthorne Effingham hotel, the Ramada London Gatwick and the Crowne Plaza London Gatwick can all provide a comfortable start to your holiday at a price to suit your pocket. If you're looking to save even more money, why not give our Gatwick Mystery Hotels a go. Mystery Hotels are discounted 3 and 4-star hotels close to, or at, Gatwick airport. They're called Mystery Hotels because, although we do tell you some information about the hotel, the name remains a secret until after you've booked. We always encourage our customers to book early, not only does it mean the availability will be greater, but it also gives you the best opportunity to bag yourself a bargain! 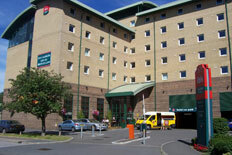 The earlier you book, the more likely you are to find our best and cheapest Gatwick hotel offers. An example of this is when you book a nights stay in the Gatwick Ibis - if you book the room a week before, the cost will be approximately £59 but when you book the same hotel package in advance, it will cost £42. A saving of £17, which in our opinion, is better spent whilst you're on holiday! We're proud of the prices we offer so it's easy for us to tell you how cheap our Gatwick hotels are. Sometimes however, you want to hear it from the people that matter the most, our customers. Take a look below to see what it is that brings our customers back time and time again.